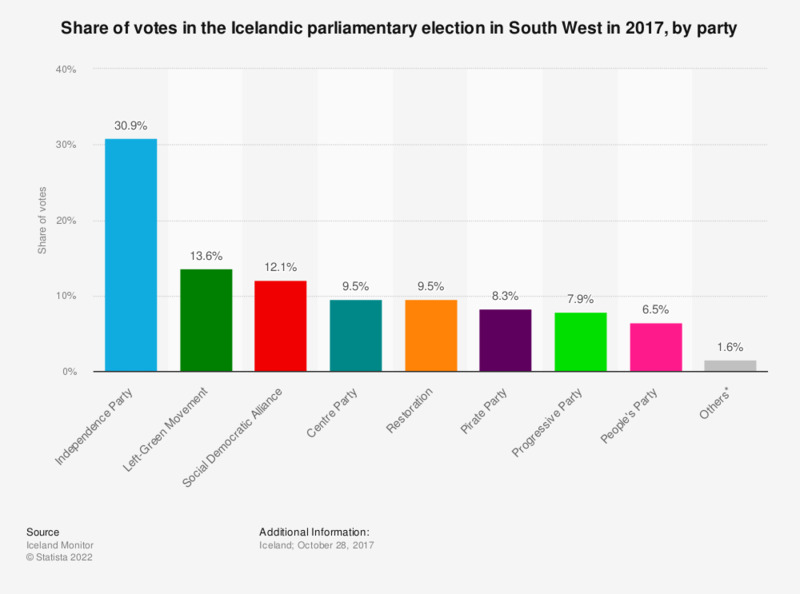 This statistic shows the share of votes in the Icelandic parliamentary election in South West on October 28, 2017, by party. The Independence Party was the biggest party in the parliament with 30.9 percent of votes. In second place came the Left-Green Movement with 13.6 percent of the total votes. The Social Democratic Alliance ranked third with an election result of 12.1 percent. Icelandic parliamentary (Althing) elections are held every four years. Due to the collapse of the Cabinet of Bjarni Benediktsson the election was preponed in 2017. * Bright Future, People's Front of Iceland.